77-year old Zhou Qingjun (周慶峻) drives his car to Guiyang Street, just south of the Presidential Office Building. As he's about to turn left, he hits a red light and stops at the intersection. Suddenly, he rolls down his window, turns around, and yells to the military police guarding the Southeastern corner of the Presidential Office Building. The military police turns his head but remains silent. Just another protester, he thinks. Zhou's car, painted in glaring red with the sign “Concentric Patriotism Association”, soon starts blaring out grandiose music from the two large speakers installed on top of the car. “Without the Communist Party, there would be no New China…” The song instantly fills the streets surrounding the Presidential Office Building. Their day starts at 10am, where almost 20 members and supporters of the Concentric Patriotism Alliance—a pro-Chinese Communist Party organization that supports the immediate unification of China and Taiwan—have gathered at the corner of Ketagalan Boulevard. 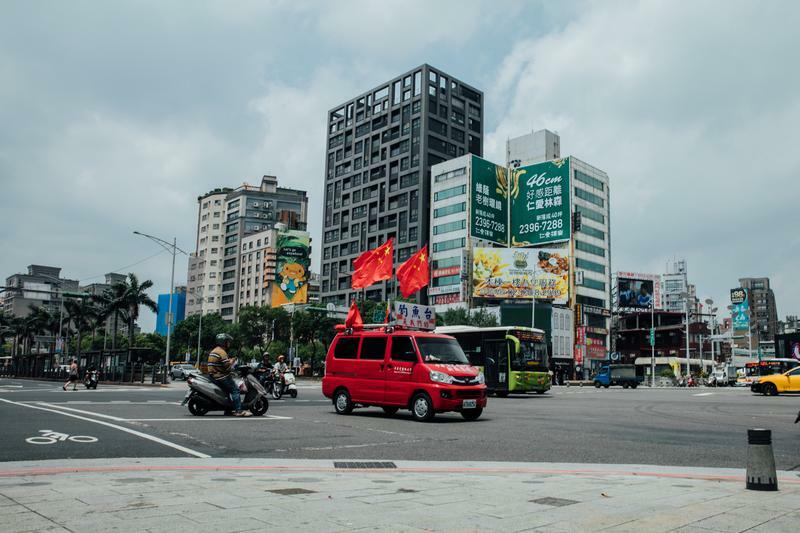 Suddenly, the intersection is full of Communist Party flags with their hammers and sickles, as well as five-star red flags—the official canton of the People's Republic of China. The scene occasionally attracts onlookers to gawk or take photos. Zhou wears a bright red jacket, a red tie, with a moustache on his upper lip. Born in 1943 in Shanwei, Guangdong province, he moved to Hong Kong in 1962, and immigrated to his wife's homeland of Taiwan in 1982. Having benefited from lenient immigration laws in Taiwan’s early years, he obtained Taiwanese citizenship just one year later. The Concentric Patriotism Association (also referred to as the Concentric Patriotism Alliance or the Chinese Patriot Alliance Association) was established with Zhou as its founding (and only) president. For the past two decades, the Alliance remained an obscure organization. 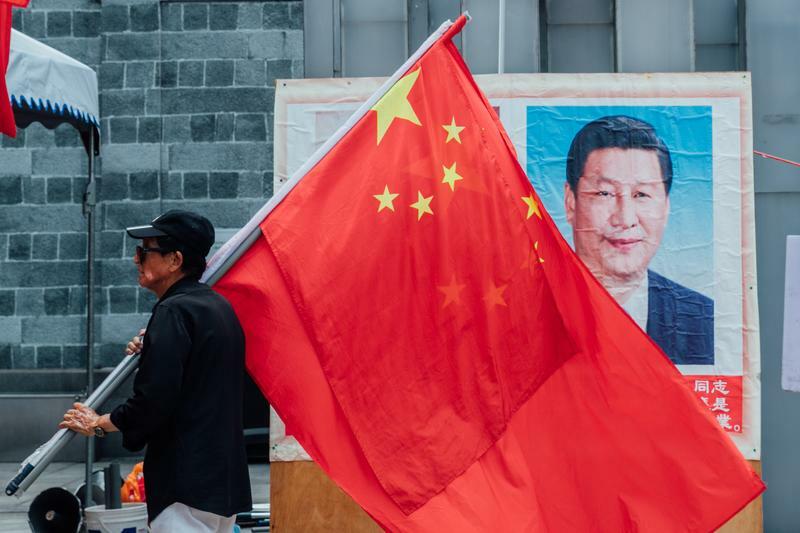 That all changed in October 2014, when the Alliance started raising five-star red flags—the flag of the People's Republic of China, a rare sight in democratic Taiwan—in front of a number of famous Taipei landmarks, including the Presidential Office Building, Ximending and Taipei 101. But it's not just the PRC flags that makes this group so conspicuous. Zhou is already in his 70s, and the rest of the Alliance is similarly grey-haired. Association Vice-president Li You-ming (李有明) is 89 years old, but still spry for his age. Tall and skinny, Li hails from Yancheng, Jiangsu Province. During the civil war between the Chinese Nationalist Party (KMT) and the Chinese Communist Party (CCP), Li participated in the 1949 Battle of Shanghai as a member of the Republic of China Armed Forces. After retreating to Kinmen, he also fought under Hu Lien's (胡璉) troops in the Battle of Guningtou. Li says that in the past, he was brainwashed to be anti-communist. His left calf still retains a scar from a bullet fired at him by the People's Liberation Army (PLA). However, seeing Taiwan evolve into something quite different from the Republic of China (ROC) of the martial law era, he has long stopped hating the CCP. In fact, he is looking forward to Taiwan's “reunification” with China. The Association's CEO is 76-year old Xiao Qin (萧勤) from Shandong province. After a 20 year stint in the PLA and three years in Macau, he moved to Taiwan in 1995. He obtained a Taiwanese passport through a preferential process for Chinese diaspora members from Hong Kong and Macau. Association Secretary-General, Zhang Xiuye (張秀葉), is a woman in her 50s, and the group's most spirited member. She arrived in Taiwan from Shanghai in 1992 through marriage, but is currently divorced. She has worked with the Association for more than ten years. Then there are the second-generation Mainlanders, like Lu Hsin-shang (呂欣尚). Lu is 64 years old, and always wears glasses with black frames. He has a refined and gentle demeanour. His business card reads “Deputy Secretary-General of the Taiwan People's Communist Party”. The Association and the Taiwan People's Communist Party, in the eyes of Lu, are the two most authentically “red” political organizations, because only they use China's five-star red flag. These two organizations also receive the most media attention and the most momentum. In contrast, the Chinese Unification Promotion Party (CUPP)—a pro-unification party with strong ties to both Beijing and organized crime in Taiwan—only raises the five-star red flag concurrently with the Republic China's “blue sky, white sun” flag. This past January, Lu received an invitation from Zhou to join the Association and migrate to northern Taiwan for this position. The Association currently has about 200 members, around 100 of them regularly attend events. 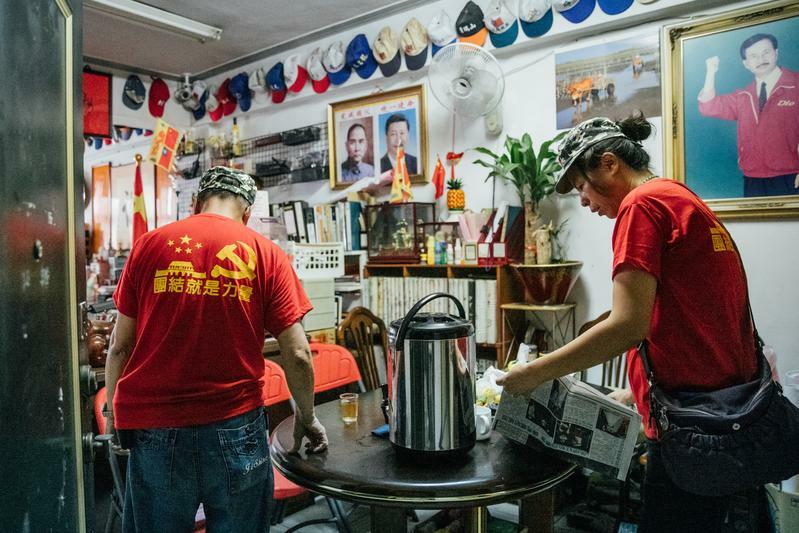 Their membership is mostly comprised of Mainlanders who fled with the KMT to Taiwan after 1949, and more recent Mainland Chinese immigrants to Taiwan. But this number also includes a minority of local Taiwanese people. Most of their event participants are middle-aged or elderly individuals who are relatively marginalized in both social status and income. Many of them work as drivers, parking managers, or caretakers, while others have already retired. Members are often busy running around at these events, but then again, so are the police officers who block off the surrounding area where Association events take place, and then tie the ROC's “blue sky, white sun” flags to all the temporary police barricades. Suddenly, the two sides of Ketagalan Boulevard are decorated with flags from both sides of the strait, as if a negotiation between the Chinese Communist Party and the Chinese Nationalist Party is about to take place. The Association raised its first five-star red flag on Ketagalan Boulevard on October 1, 2005—the day the People's Republic of China commemorates “National Day”. The event was a reaction to a similar flag raising ceremony held by an organization that supports Taiwanese independence. In the summer of 2005, a citizen-led initiative called the 908 Taiwan Republic Campaign proposed establishing September 8—the day Japan gave up its territorial claims to Taiwan in the 1951 Treaty of San Francisco—as the independence day of a future Republic of Taiwan. On the morning of the 8th, about 500 supporters watched as 908 Taiwan Republic Campaign convenor Peter Wang (王獻極) raised a new blue, green, white and red flag with the words “Republic of Taiwan” place in the centre. In retaliation, the Association raised China's five-star red flag in the same location, celebrating the establishment of the PRC. In the years following that incident, the Association has been relatively quiet. That all changed when Chinese President Xi Jinping (習近平) took office in 2012. Since then, a series of complex changes began to arise among “red” organizations promoting unification in Taiwan. 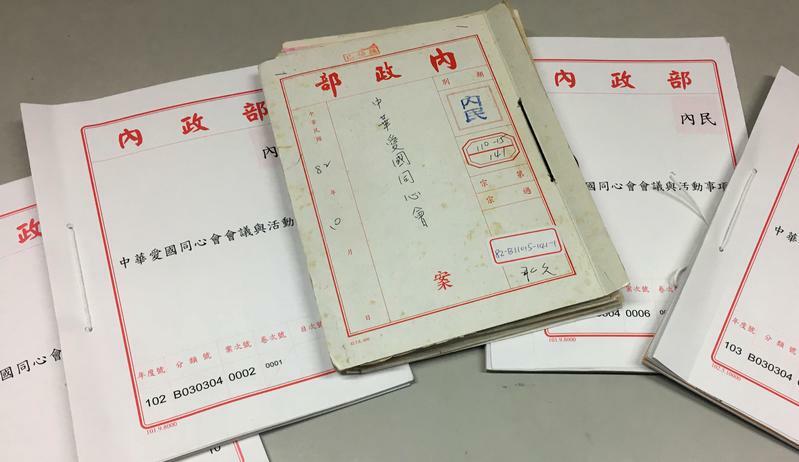 The Reporter accessed more than 20 files relevant to the Association from the archives of Taiwan’s Department of Civil Affairs. Documents show that the Association amended the party constitution just one year into Xi's first term. Documents recovered from the Department of Civil Affairs on the Concentric Patriotism Association. Yu Chih-wei/The Reporter. In the latter half of 2015, members began putting up flags in Ximending, a popular shopping area in Taipei. The Reporter observed many of these events, and counted about 40 to 50 people in attendance. Zhou is often seen at these events waving two five-star red flags, shouting “Go China!” in his Cantonese accent. Amid low approval ratings for then-president Ma Ying-jeou and the events of the Sunflower Movement, members of the Association worried that the Democratic Progressive Party (DPP) could take office again, and would deny the group the right to protest. Association events were then re-framed to become regular occurrences and a conventional practice. Concentric Patriotism Association Secretary General Zhang Xiuye. Yu Chih-wei/The Reporter. A core member of the Association who wished to remain anonymous said that in the past, the KMT would monopolize resources sent by Beijing. But over the past several years, more attention is being paid to smaller political parties and groups. Wu adds that Association members are different from traditional Taiwanese business people who support China's model of authoritarian development out of opportunistic commercial interests. “Members of the Association reflect characteristics of a pre-modern, blood-based conception of national identity. They share a strong sense of identification with the Chinese nation, in contrast to a modern-day civic nationalism”, says Wu. Among these people, many have a personal background or trajectory of migrating from China to Hong Kong or Macau, and then to Taiwan. This trend also mirrors Beijing's strategy in recent years to develop on-the-ground alliance networks in Hong Kong, the most visible example of which being groups whose names start with the first Chinese character “love”. These groups spare no effort in helping the CCP resist the democracy movement in Hong Kong. Taiwan is not spared from such infiltration. China's “united front activities” have indeed taken root in Taiwan, but the full reach of these activities is still unclear. In October 2017, members of the public used a government-backed online participation platform to propose banning the use of the PRC's five-star red flag on Taiwanese soil. Freedom of speech ensures the right to wave the flag of an opposing political administration. However, the Association remain disapproving of Taiwan's democracy. “Taiwan is indeed democratic, but so what? Look at Taiwan's economy. It has been stagnant for the past twenty years. When I first came to Taiwan, it was indeed better than Shanghai. But now, Taiwan is far behind Shanghai,” says Zhang. Her comments represent the attitude of most of the Association. Compared to intangible democratic freedoms, they care more about a “strong motherland”. Witnessing the rapid development of the Chinese economy has further fuelled their longing for the “China model” and cross-strait unification. Yuan Huanzhen (袁煥珍), a woman who migrated to Taiwan from Sichuan province for marriage, once spoke to Wu Den-yih (吳敦義) at a campaign event when he was running to be the party chairman of the KMT in 2017. Some members of the Alliance, however, are not so contemptuous of everything in Taiwan. With regards to the survival of “red” pro-unification organizations in democratic Taiwan, Wu Jiemin looks at this phenomenon from the theoretical perspective of civil society. “Theirs is a ‘fake civil society’ that fundamentally does not recognize Taiwan as a political community, but proceeds to take advantage of Taiwan's democratic public wealth,” says Wu. “Your height is just about the same as Zhou”, says Xiao Qin to this reporter. Xiao isn't referring to Zhou Qingjun, the leader of the Association, but to Zhou Hongxu (周泓旭), a Chinese national recently arrested for spying for the CCP. A graduate of National Chengchi University, Zhou Hongxu was taken into custody in March 2017, becoming the first case of a Chinese exchange student working as an undercover operative in Taiwan. Xiao says Zhou Hongxu attended Concentric Patriotism Association events frequently. “Wang Ping-chung (王炳忠) has also attended our events,” says Xiao. Wang Ping-chung is the New Party's 31 year-old spokesman, and leader of the New Party's Youth Corps. The New Party is the product of a 1993 split within the then-ruling KMT, and has gone on to become the most vocal mainstream political party to advocate for unification. This June, Wang and three other New Party Youth Corps members were arrested on charges of espionage. Prosecutors found evidence that Wang had worked with Zhou Hongxu to infiltrate Taiwan's military, and attempted to create a network of young, pro-Beijing collaborators within political circles. “Perhaps their contact was too frequent, which attracted these wrongful lawsuits against Zhou,” says Xiao. The Association believe that Zhou's court verdict was unjust. But from a Taiwan's perspective, as cross-strait relations continue to deteriorate, the impact of the “China factor” continues to deepen, leading the Taiwanese government to pay closer attention to possible infiltration by the CCP. The majority DPP caucus in Taiwan's Legislative Yuan recently proposed changing the definition of organized crime in Taiwan's Regulations on the Prevention of Organized Crime from “continuous and profit-seeking” to “continuous or profit-seeking.” Based on the context of the proposed changes, it's likely the DPP's bill seeks to target pro-unification political parties like the Association and the Chinese Unification Promotion Party (CUPP). The CUPP and the Association believe that Taiwan's Ministry of Interior—the ministry responsible for managing the country's political parties—is deliberately making things difficult for their respective parties by sending auditors to monitor their finances. When Xiao Qin encounters said auditors, he doesn't miss a chance to scold them. “Today, you have the power to clear our accounts, but when I have the power one day, it will be me who's clearing yours!” says Xiao. However, auditing the Association's finances has little to do with creating obstacles for the group. For instance, the annual report submitted by the Association to the Ministry in 2017 lists $560,000 New Taiwan dollars ($18,000 USD) of “political party funding”. Taiwan's regulations on political party funding states that political organizations must report and seek approval from the Control Yuan—the political body tasked with monitoring the government—before accepting funds. The Association has never reported special accounts for political party funding, leading the Department of Civil Affairs to send a letter on September 6, 2017 requesting an explanation. According to the Act Governing Relations between the People of the Taiwan Area and the Mainland Area, unless granted permission, organizations in Taiwan may not engage in any form of cooperation with Chinese political parties, the government, or military institutions. Members of the Association do not shy away from discussing their contact with various levels of the Chinese government, including the Taiwan Affairs Office (TAO), the main political body tasked with setting China's guidelines and policies related to Taiwan. Xiao Qin mentions that he's dined with Gong Qinggai (龚清概), the TAO's former Deputy Director. Members of the Association often describe their life in a grandiose and dramatic fashion, full of intrigue and intelligence activity. For instance, they assume their telephone calls are monitored and compromised, and believe they are on the Taiwan government's “black list”. The truth is far less glamorous. During Xiao's time in the PLA, he directed the department of health and did some work for the Communist Youth League of China. After arriving in Taiwan, he worked as a baker, not a spy. At 201 Xining South Road, near the busy Ximending shopping area, the Association occupies floors two to five in an old walk-up apartment building. The Main office on the second floor is covered with framed portraits of Sun Yat-sen and XI Jinping, with printed Chinese characters reading: “Complete the founding father's mission of national reunification. The offices of the Concentric Patriotic Association. Yu Chih-wei/The Reporter. Sources say the Association spends more than $100,000 NTD ($3,200 USD) on expenses every month, the majority of which is covered by Zhou Qingjun. But aside from Zhou, there are few other members that have been with the organization since the beginning, and the origins of the group are buried in rumours and gossip. Li You-ming believes the Association was founded by Ma Ying-jeou's father, Ma Ho-ling (馬鶴凌), and also shares a connection to the martial law era KMT party magazine Ji Feng (疾風). Zhou also insists that the Association has no history as an anti-communist organization. But documents from the Department of Civil Affairs show this to be false. Even Xiao Qin mentions that the Association initially opposed communism. The relationship between the Concentric Patriotism Association and the Chinese Unification Promotion Party is also complex and difficult to summarize. Founded by former Bamboo Union crime boss Chang An-le (張安樂), the CUPP shares a close bond with the CPP, formed when Chang was hiding in China while on the run from Taiwanese law enforcement. Many Taiwanese people believe that the two organizations share similar political positions and operations. In fact, some even confuse the two. A link to the CUPP even appears in a cached snapshot of the Association's old website. Zhang Xiuye also mentions that a CUPP candidate running for Taipei City Council, Lee Cheng-lung (李承龍), has close ties to the Association, and is a frequent participant in their events. However, according to Zhou, the CUPP at most shares similar political ideas with the Association, and the two have no substantial connection. “We do our thing, and they do theirs,” says Zhou. In fact, it appears one event in particular led to a rift between the two pro-reunification organizations. During the “Sunflower Movement” student protests against a secretive free trade pact between Taiwan and China, the CUPP and the Association bandied together to hold a counter-protest in support of the KMT-CCP negotiated deal. On April 1, 2014, the day of the event, the Association and the CUPP were unable to properly coordinate their respective automobile convoys, with the CUPP's Chang believing the Association were trying to steal his thunder. The two groups had a public falling out at the scene of the counter-protest. Despite the bad blood, some members of the CUPP express concern for the Association. 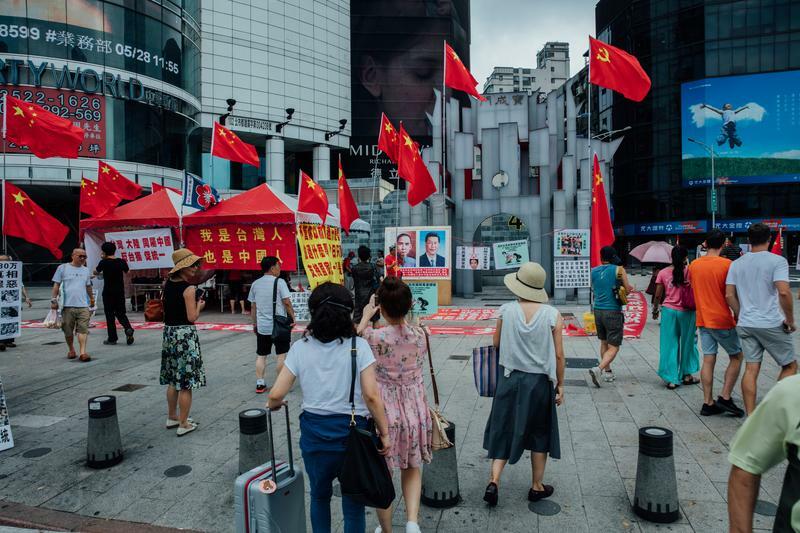 “Because many in the Association are elderly or physically weak individuals, I've routinely brought a few people to support their monthly events at Ximending,” said an anonymous CUPP party branch member. However, due to recent scuffles with pro-independence groups, said branch member has become embroiled in a lawsuit himself, and has been unable to organize support for their events. During the Association's protests at Ketagalan Boulevard, people occasionally approach Zhou Qingjun to initiate a conversation. In April, an elderly male participant pulled Zhou aside, seemingly complaining about an unresolved situation he has encountered. At the end of the conversation, Zhou tells him: “if this issue cannot be addressed, I will deal with it for you when the Communist Party arrives!” Afterwards, the elderly man talking to Zhou decides to join in, and starts to wave a five-star red flag. Zhou quickly finds an opportunity to snap a picture of this elderly new Association volunteer. With PRC flags fluttering in front of the Presidential Office, it's not just tourists and passerby's snapping photos of this strange event, sometimes Zhou himself needs to stop and document the “red sea” of five-star red flags. One of the Concentric Patriotism Association's red minivans. Yu Chih-wei/The Reporter. “When Zhou is not in Taiwan, he will remind us every day that we must take photos at our events,” says Lu Hsin-shang. What is the purpose of these photos? “So we can tell China's Taiwan Affairs Office that we hosted many events,” says Xiao Qin in a matter-of-fact way. Xiao has lost his temper with other pro-unification parties in the past. He accused Lu Yuexiang (盧月香) of the China Production Party—a political party that mobilizes Mainland Chinese spouses living in Taiwan to vote for pan-blue or pro-unification parties—for reaping financial benefits in China while neglecting the party's “due diligence” to influence Taiwan public opinion to support the CCP. So the question has become, are red and pro-unification political organizations united by a similar political ideology, or are they mere supporters of practical benefit? The Reporter spoke regularly with participants at Association events, many of them said they attended every week (even every week day) and insisted their participation was entirely voluntary. Some say that these participants have a high level of commitment to the cause because they were former CCP members prior to coming to Taiwan. Zhang Xiuye admits that because she works full-time at the Association, she does receive a salary. Others do not earn an income for their involvement. But Zhou Qingjun says everyone is a volunteer, and at most, members only receive a reimbursement for travel costs. According to documents from China's department for industry and commerce, Zhou and his wife Lin Mingmei (林明美) registered an investment firm with $2 million RMB ($288,000 USD) in registered capital in 2011. Zhou’s firm was reported to have initially invested in golden snapper aquaculture breeding grounds, with plans to invest a further $50 million RMB ($7.2 million USD). The author of the report was a TAO media officer in Hubei province, where Zhou began his investments in 2010. Other articles claim he invested in about 66 hectares of mountainous land in the city of Dangyang, Hubei. When an epidemic erupted in his fish ponds, the city-level TAO director in Dangyang sent experts to resolve the situation. When his fish became unsellable, Hubei's provincial-level TAO director made personal calls to channel sales for his company. Despite the local government's support, Zhou's business earned dismal profits, and ended in failure. 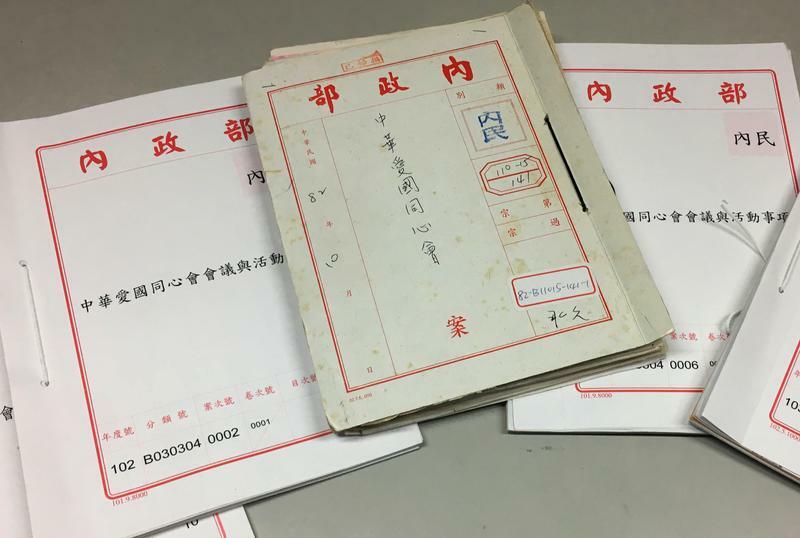 This April, a TAO website published a notice that Zhou'property in Dangyang has been left untouched for a long period of time, due to its location and the nature of the land. The TAO notice explained “the importance of properly managing the legal assets of Taiwanese merchants, and the significance of ensuring the legal rights of Taiwanese merchants,” and later persuaded a local Chinese company to purchase the property. When pressed about these reports, Zhou laughs and denies the existence of the aforementioned assets. However, he did note to The Reporter that “it's really not good” that the TAO writes about his investments and publishes it on the internet. Zhang Xiuye is Zhou's closest associate, and confirmed his investment in Dangyang, Hubei. She refutes the claim that Zhou planned to invest $50 million RMB and that $2.2 million RMB ($322,000 USD) is a far more likely figure. His business was supported by the Dangyang government because there was no electricity when he started his investment, says Zhang. The climate was cold, and the fish didn't grow well. He also wasn't clear about the nature of the land, and spent $300,000 RMB ($43,000 USD) on building a second floor. He went on to sell the property for only $100,000 RMB ($14,000 USD). Zhou has since moved on to investments in the coastal city of Zhuhai, in Guangdong province, where he plans to open a retirement home. “To clarify, this is not to make a profit” he says. He was recently reported to have invested in agricultural land in Zhuhai's surrounding countryside, where he's said to have a number of aquaculture breeding ponds. Although Zhou says the land and ponds are quite sizeable, Zhang says the true size is smaller than he claims. “Investments there can in fact return profits,” says Zhang “which subsidize some of the Association's expenses.” She adds that Zhou rented the new land in Zhuhai from the people, and not from the government. Between three and five in the afternoon, every Monday to Friday, the Association promotes “red, pro-reunification thought” in front of Taipei 101, where half a dozen supporters show up. These regular events are how many visitors to Taiwan learn about the Association, and their display of five-star red flags has become an unusual attraction in Taipei City. For six years, Xiao Qin has worn his army cap, held a five-star red flag, and sang his own edition of “Ode to the Motherland”—a famous patriotic song written shortly after the founding of the People's Republic of China. Charter buses loaded with tourists from China will stop in front of Taipei 101. Xiao Qin usually approaches them, many of whom are eager to take photos or clap for him. 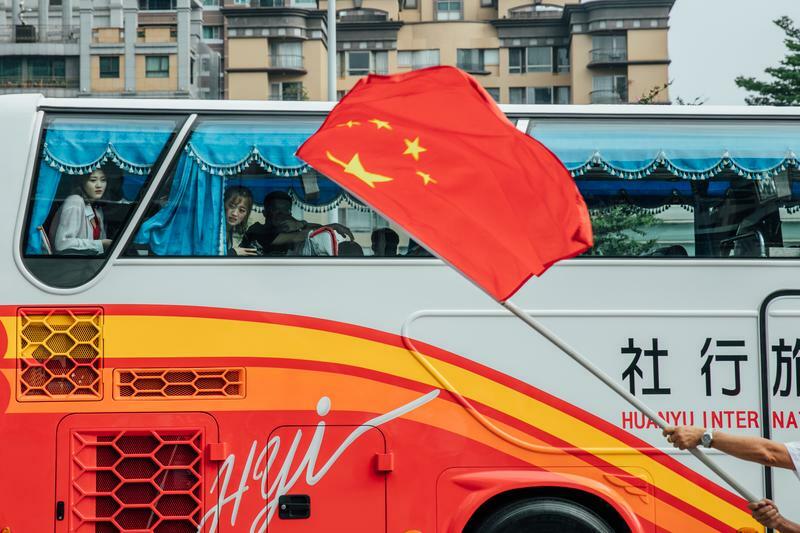 An Association member waves the PRC canton in front of a charter tour bus. Yu Chih-wei/The Reporter. The Reporter asks Zhou, shouldn't promoting national unification with China mainly be targeted towards Taiwanese people? He gives an unusual response. Stationing themselves in front of Taipei 101 is to ensure “Mainland Chinese tourists aren't pulled away by ‘bad people’”. Zhou is referring to members of the Falun Gong, who have stationed themselves in front of Taipei 101 for the past ten years. Members of the religious group often gather at major landmarks visited by Chinese tour groups. They hand out pamphlets about CCP abuses against Falun Gong practitioners in China, perform Qi Gong exercises, or sit in silent meditation. That led the Association to bring banners and posters of their own. Over the years, the Association and the Falun Gong have sued and counter-sued each other for dozens of transgressions, including defamation, violating social order, compensation for damage and infringing on personal freedoms. Some suits are successful while others fail. In the most serious criminal case, Xiao Qin was sentenced to 55 days in custody. Because the two groups have been “warring” with each other for so long, members of the Association and the Falun Gong have gradually gotten to know each other. When they're not fighting, they sometimes share a few words of conversation. Association Vice-President Li You-ming walks in front of a portrait of Xi Jinping. Yu Chih-wei/The Reporter. Once, Xiao Qin happened to be standing in front of a pile of Falun Gong promotional materials. He saw a piece of paper fly from the pile, and fall to the ground. Xiao bent down to pick up the piece of paper, and after a brief moment of hesitation, put the piece of paper back in its original place. “End scene” or merely “scene change” for the Association? Over the last five years, the Association have seemingly become a permanent fixture at Taipei 101 and Ximending. But things are about to change for the organization. According to the Political Party Act passed in 2017, political organizations established under the Civil Associations Act must revise their articles of association to become political parties with the next two years; they are then obligated to nominate candidates to run for office. If organizations like the Association do not complete this process in a four-year time frame, they will be disqualified and disbanded. For a political organization that still handwrites their correspondence with Taiwan's Department of Civil Affairs, the Act is pushing the 25-year old Association to consider change. Zhou says elections have been on his list of initiatives for a long time, and he wants to put forward Association candidates to run in the November 2018 local elections. 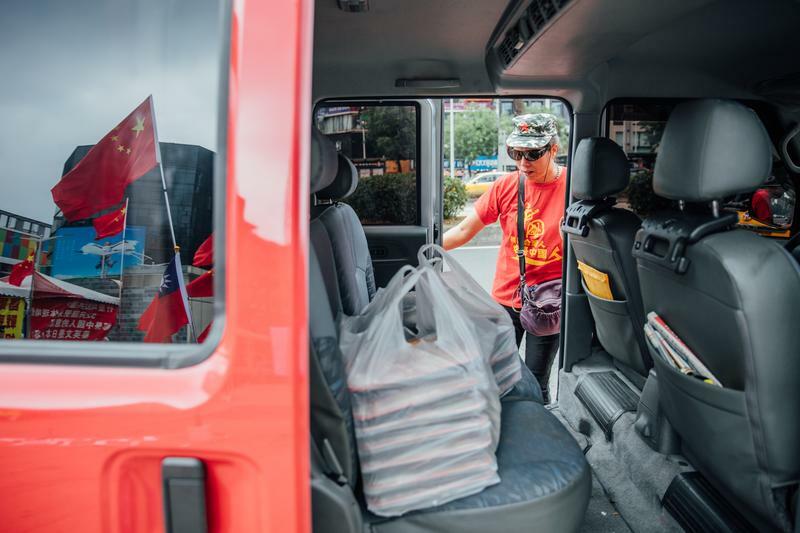 After President Xi took the stage, Beijing moved to create a network of collaborators by appealing to a blood-based national culture; pro-unification organizations in Taiwan gained a new life. 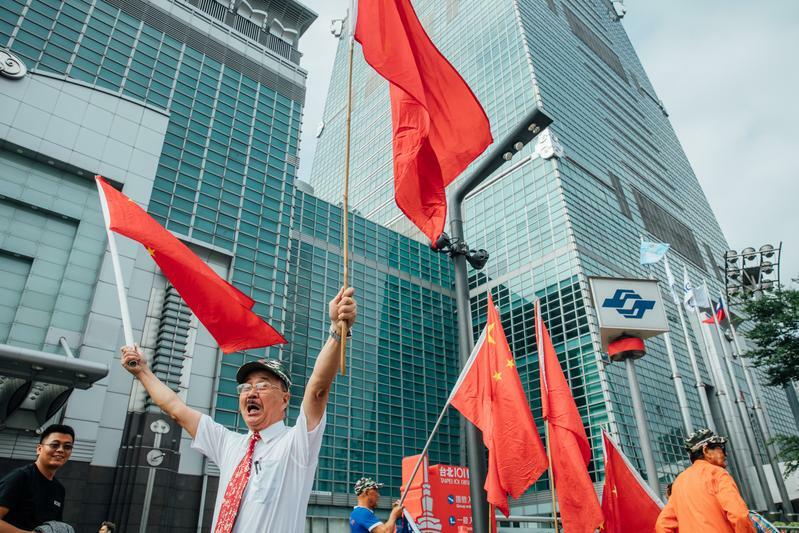 The Association is by no means, representative of public opinion in Taiwan, but scenes of grey-haired supporters holding five-star red flags singing “red songs” will continue in this democratic country. Then again, cooperation (and competition) between Taiwan's various red, pro-reunification organizations is also unlikely to see a curtain call any time soon.